You don’t want to be caught in a heavy downpour without the right gear. Not only will you want a good rain jacket, but also a good pair of rain pants. Nothing is worse than having your hiking pants completely soaked for hours. Look for pants that are not only waterproof, but also breathable and durable. They will potentially have to get you through rain, snow, and mud. Also, look for lightweight pants as you don’t want to be weighed down by gear that you may not need. 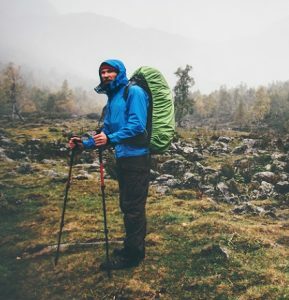 There are several other features to consider when looking at rain pants, and we walk you through each of those factors to help you decide what is best for you. Such as leg zippers, pockets, waist belt cinches, and pant cuffs. We took a look at some of the industry’s best rain pants and here are our 5 Top Picks. The Foray is a highly water resistant rain pant with excellent mobility. They offer a great combination of storm-worthiness, durability, ventilation, breathability, and weight. It only has one pocket and 3/4 length zippers. The waterproof material is made of 2.5 layer Gore-tex with PacLite Technology. One of the greatest qualities of the Foray would have to be the amount of freedom of movement that it offers. They are great for staying active and mobile in any weather condition. They are also lightweight and pack down extremely well. The 3/4 length zippers allow you to slip them over higher volume footwear. The zippers are watertight and include an internal storm flap that helps in keeping water out. The articulation in the legs is very well designed, so you get a great range of motion. The crotch is gusseted providing comfort and unrestrictive mobility. There are no bulky Velcro flaps that trap against your hips or constantly come undone. The 3/4 zippers also offer excellent ventilation, as long as it wasn’t extremely rainy. The Foray rain pants are highly breathable as well. The Foray features two loops in pant cuff that can be threaded with a small diameter cord to help seal the boot cuff. This allows the pant cuff to fit perfectly against your boot, which eliminates the need for gaiters and saves weight. These pants also offer loops for suspenders for those who might want to add this feature. There are not a whole lot of extra bells-and-whistles added to these pants, but that is what allows them to save weight. They are simple, yet extremely effective. The Foray pants are extremely durable and tough. You will be able to achieve protection on extended outings in inclement weather. Overall, these are a great option for protection and weight saving. The Stretch Ozonic rain pants are constructed with extremely stretchy fabric offering high mobility, range of motion, and breathability. These pants are also very breathable and packable. These pants feel like a soft shell jacket, allowing comfort of movement. They aren’t quite as abrasion resistant or weather-resistant as other models, but get the job done. It is equipped with Velcro waist flaps. They are designed with four-way stretch fabric that offer high mobility and freedom of movement. The Ozonic rain pants are extremely lightweight, which is key among backpackers. They are also more breathable than the average rain pant. For waterproofing, these pants us Dry Q Active 2.5-layer fabric which provides just above average water protection. These pants feature small storm flaps and watertight zippers that let very little water in. However, there is room for improvement as far as storm-proofing is concerned. The pant legs are articulated extremely well, offering movement that is not restricted. These are a great choice for adventures that require a lot of mobility. There is also a built-in flat webbed waist belt, which helps in keeping the pants from falling down. They also include a micro-fleece lining on the inside of the belt which delivers comfort against your skin. This is a great feature for long adventures. The Dry Q fabric is air permeable and doesn’t require the wearer to build up heat in order to start the process of moving moisture from the inside to the outside. 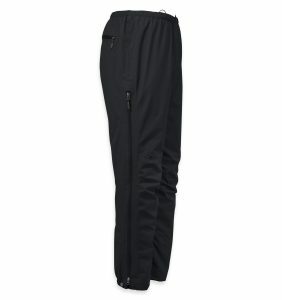 These pants include full-length side zippers for ventilation in light rain or after rainfall. Keep in mind that if conditions are too wet out, or even a slight rain, will lead to getting wet if your skin or shoes are exposed. The Ozonic rain pant is extremely durable and will hold up with rugged use. The full-length zippers make pulling these pants on over any boot a breeze. The Velcro flaps above these zippers aren’t the most secure and come undone more frequently compared to other rain pants on the market. However, the flaps are smaller and less bulky than some of the other pants. The Outdoor Research Helium are some of the lightest, most compact pants on the market. They have an elastic waistband that offers great mobility and comfort, and provides storm-proof protection. These rain pants are less durable than some other brands and can be hard to pull over boots. They are also about average on the breathability scale. However, they pack down super small, saving you plenty of space in your pack. The waterproofing material is made of a Pertex Shield membrane, and the face fabric is 30D nylon ripstop. The Helium rain pants caters to the travelers that want to bring a pair of rain pants just-in-case. Because of this, they are not the most versatile or feature rich rain pain. They do perform extremely well for their weight, so if a lightweight pack is your priority then these are the pants for you. They are perfectly suited for the fast hiker in rainy climates. The waterproof 1/4 length side zippers are waterproof, reducing the chances for leakage. The back pocket includes a flap over the zipper instead of a fully waterproof zipper. This makes it easier to inver the pocket and stuff the pants into the pocket for packing. The flap is placed to block drips in the direction of gravtiy. 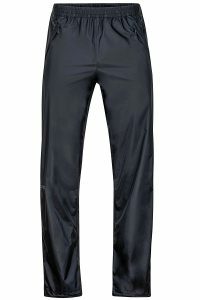 The Helium is a great pant for wet weather running. They are tapered to keep the pant legs from flopping around when moving quickly, which increases comfort levels. However, they are not ideal for layering over warm pants. They are better suited to pair with running tights. The crotch is gusseted to provide mobility and range of motion. A down side is that in humid rain, the plastic feel of the material makes it more likely to stick to your skin. Overall, they are extremely mobile for high energy activities. The fabric floats with you and moves around less, which aids in keeping rain out. There are no vents on these rain pants, only the 1/4 length side zippers. They still offer plenty of breathability. The 2.5 layer rain shell can often feel plastic on the inside and get clammy when wet. This can happen with the Helium pants, but the fabric is so thin that your own body heat will pump out the moisture and dry wet patches. 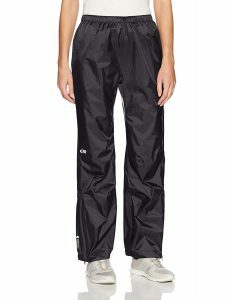 These rain pants can be stuffed into their own back pocket, where there is a clippable loop for attaching to anything. This feature allows you to clip them to a harness if you need quick access in a sudden burst of rain. They have an adjustable elastic drawcord for tightening, as well as cuffs around the pant legs to ensure they stay in place around boots. Due to the lightweight nature of these pants, they aren’t as durable as some other rain pants on the market. The Columbia Rebel Roamer are offers decent weather-resistance, packed volume, and versatility. The weight is still also fairly light. They aren’t super breathable and offer very few features. For folks on a budget, the Roamers are a light enough to work as a just-in-case layer, but versatile enough to use for skiing, hiking, or snowboarding. 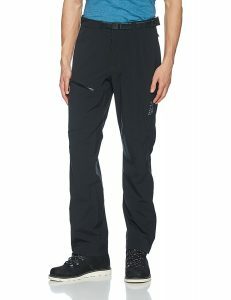 These pants are a great choice for a rain pant within the $50 price range. They hold their own with comes to storm worthiness and are a great choice for hikers and backpackers alike. The weather-resistance is exceptional and will keep you dry. The Rebel Roamer are a pretty comfortable set of rain pants. They waistband has a low profile, allowing a backpack’s waist belt to be worn over the top, with minimal pinching. They also come with a shock cord and cinching toggle that help to keep your pants from inching down. The internal fabric is comfortable against bare skin, and offers above average mobility. The cut is wider than average, giving a little more wiggle room than other rain pants. Unfortunately, there are no ventilation options feature on the Roamer. However, for a just-in-case pant, or someone on a budget, they work fine. The lack of breathability is not a huge issue unless you plan to be in extremely damp conditions more often than not. These pants do offer Velcro pant tighteners/closures on the lower cuffs of the pant. This helps to seal out snow and other debris. These pants will pack down really well, saving you plenty of space in your pack. Even thought they are lightweight, the Rebel Roamer is surprisingly durable. They are pretty abrasion resistant, making them a great choice for on the slops or off-trail travel. They do put up a little bit of a fight when pulling over shoes. You may even have to remove boots to get these rain pants on and off. The Marmot PreClip is an extremely breathable rain pant that is easy to pull on and off thanks to their full length zippers. The NanoPro fabric is an extremely breathable fabric. These pants are feature rich, yet still have a respectable weight and pack size. 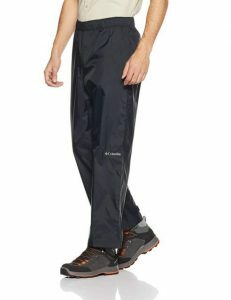 These rain pants are highly functional and reliable for trekking, backpacking, and mountaineering. They have a nice balance of storm worthiness, weight, and functionality. The PreClip offers excellent weather-resistance. The fit is lightly looser than average, which increases mobility and range of motion. The pant leg articulation also helps out with this feature. These rain pants also offer great ventilation. They feature two full-length zippers which allow for plenty of ventilation from top to bottom. They also use a higher gauge YKK zipper, that makes the side zippers more durable and less prone to jamming than other models. There are Velcro closures at the tops of the zippers, on the pant waist, that help to keep the pants from falling down. There are two pockets in the front and one in the back. The PreClip features an elastic shock cord with a toggle that helps to cinch pant cuffs. You still might need gaiters in snow. Overall, these pants perform great on off-trail travel. The PreClip includes 100% nylon rip-stop exterior that is extremely durable. These pants are also some of the quickest rain pants to deploy or remove over any boots. Rain pants are an extremely simplistic piece of travel equipment. There are not a whole lot of factors to consider. You just want to make sure they protect you from the elements and don’t add too much weight. Below we cover some of the main factors that you should consider when looking at rain pants. The material is a key factor in ensuring that your rain pants are waterproof, breathable, and durable. There are many different fabrics to choose from. Most manufacturers develop there own, but Gore-Tex, Pertex, and Polartec are also popular fabric options. Waterproof pants are made of fabrics consisting of either 2, 2,5, or 3 layers of fabric. The more layers, the more waterproofing protection your pants will achieve. 2-layer protection is basic against the rain, but are more affordable. If you will be in severe conditions, its best to go with 3-layer protection. You want to be able to pull your pants over your boots easily and quickly, for fast removal and deployment. Leg zippers help to achieve this by allowing you to increase the size of the pant cuff. They can range from short ankle length to full-length zippers. Your shoes, or boot size will factor in what length your leg zippers need to be. Obviously, the bigger the shoe, the bigger the leg zippers should be. You want your rain pants to fit comfortably and offer great freedom of movement. Most likely you will be layering your rain pants over your normal hiking pants, so you want to be sure they will fit. You might even want to consider sizing up. Every rain pant focuses on a different factor, with some being more feature rich than others. These options tend to cost more money than more simplistic rain pants. If cost is a factor, you’ll still want to ensure your rain pants are storm worthy. The main point is to stay dry after all. You’ll also want to be sure that your pants can slip on and off fairly well. If a downpour starts all of a sudden, you don’t want to be caught out in the rain fighting with your rain pants. 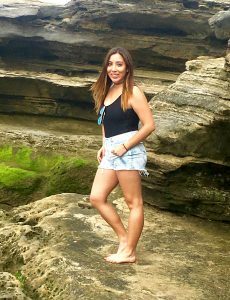 Overall, you want to stay dry and be able to move freely. You don’t want to feel clammy or restricted. Therefore, you’ll want to search for high levels of waterproofing, breathability, and mobility.